Development of a live-action Shazam! film began at New Line in the early 2000s, but was delayed for many years. The film went into pre-production in 2009 with director Peter Segal and writer John August, and Dwayne Johnson considered to star as the villain Black Adam, but the project fell through; Johnson acts as an executive producer on Shazam!. William Goldman, Alec Sokolow, Joel Cohen, Bill Birch, and Geoff Johns, among others, were all attached to the project as writers at various points. The film was officially announced in 2014, with Johnson attached to star as either Shazam or Black Adam. He would later be cast in January 2017 to lead a solo Black Adam development project. Sandberg signed on to direct Shazam! in February 2017 and Levi was cast that October, with Angel joining the following month. Principal photography began in Toronto, Ontario, Canada on January 29, 2018, with most of the film shot at Pinewood Toronto Studios, and wrapped on May 11, 2018. Shazam! was released in the United States by Warner Bros. Pictures in RealD 3D, Dolby Cinema, and IMAX 3D on April 5, 2019. The film has grossed over $321 million worldwide and received praise from critics for Sandberg's direction and the performances of Levi, Angel and Grazer, as well as its light tone and sense of fun. A sequel is currently in development. In 1974 Upstate New York, young Thaddeus Sivana is arguing with his father and brother during a car trip when he is transported to the Rock of Eternity, a magical temple hidden in another dimension. He meets the ancient wizard Shazam, the last of the Council of Seven Wizards, who has spent centuries searching for a new champion who is "pure of heart" after the previous champion went mad, releasing the Seven Deadly Sins upon the world. Thaddeus is tempted by the Sins, entrapped in statues, and is deemed unworthy and banished back to Earth. Upon returning, he makes a scene trying to go back which causes the car to swerve and crash; his father ends up crippled and his older brother blames the incident on him. In present-day Philadelphia, foster kid Billy Batson runs afoul of the law while searching for his birth mother and is placed in a group home run by Victor and Rosa Vazquez with five other foster kids; Mary Bromfield, Pedro Peña, Eugene Choi, Darla Dudley and Freddy Freeman, Billy's roommate and superhero enthusiast. Meanwhile, an adult Sivana, embittered by his rejection as a boy, discovers a way to return to the Rock of Eternity. There, he steals the Eye of Sin, becoming the Sins’ vessel and besting the Wizard before returning to Earth to kill his father and brother. At school, Billy saves Freddy from bullies and is chased into a subway, where Shazam magically summons Billy, chosen as the new champion. By calling Shazam's name, Billy is transformed into an adult superhero now endowed with the wizard's name; thanking Billy, Shazam the Wizard turns to dust, leaving behind his staff. Returning home, Freddy helps Billy explore the extent of his newfound powers: electricity manipulation, invulnerability, super strength, hyper speed and flight. Freddy's videos of Shazam testing his powers become a viral sensation, and Billy begins skipping school to use his powers for money and fame in Shazam form. Seeing Shazam save a bus on the news, Sivana challenges and easily defeats Shazam. Sivana demands Shazam surrender his powers, but Shazam transforms back into Billy to escape into a crowd. From the news, Sivana deduces Billy's identity and abducts Freddy to find Billy. At the Vazquez home, the other children also deduce Billy's secret and tell him they have found his mother, who lives nearby. Billy meets his mother, learning she abandoned him when she was a single teenage mom. Sivana calls Billy, having taken his foster siblings hostage, and Billy as Shazam agrees to give Sivana his powers to spare his family's lives. Sivana and Shazam travel to the Rock of Eternity, where Sivana takes the wizard's staff, but the siblings follow and attack Sivana. Shazam uses the distraction to stun Sivana and realizes that Sivana loses his powers when all Seven Sins leave his body. Sivana pursues Shazam and his siblings to a winter carnival, unleashing the Sins upon the crowd. As Wrath battles Shazam, the other sins capture his family, demanding his powers. However, when Sivana recalls the sins, Shazam uses the opportunity to take the staff and stuns Sivana. Remembering the Wizard's words, Billy uses the staff to share his powers, transforming his siblings into adult superheroes like him. [N 1] Shazam breaks the staff and battles Sivana, whilst his siblings distract the Sins. Shazam baits Envy out of Sivana's body, leaving Sivana powerless, and takes back the Eye of Sin which recaptures all Seven Sins. Billy and his family are hailed as heroes, and Billy embraces his foster family as his true family. Returning The Eye and the Sins to their prison, Billy and siblings realize the now vacant Rock of Eternity can be their new lair. Later, Billy arrives at school in his Shazam form to have lunch with his siblings, revealing he has invited Superman, much to Freddy's joy. In a mid credits scene, the imprisoned Sivana is approached by Mister Mind with a proposal claiming he can give Sivana his powers back. In a post-credits scene, Freddy tests whether Shazam’s champion form has fish telepathy like Aquaman, which Billy dismisses as stupid. Asher Angel and Zachary Levi as William "Billy" Batson / Shazam, respectively: A troubled orphan boy who is chosen as the "Champion of Eternity". Given powers by an ancient wizard, he transforms into an adult with superpowers when he calls the sorcerer's name. Batson is chosen as the new Champion, eons after the Council of Eternity selected another hero, who eventually killed all of the Council except for Shazam. The powers given from the ancient wizard to Batson include gifts bestowed upon the sorcerer from various others. These powers include: the Wisdom of Solomon, the Strength of Hercules, the Stamina of Atlas (near-limitless resilience), the Power of Zeus (lightning control and magical resistance), the Courage of Achilles (near indestructibility), and the Speed of Mercury (also provides flight). The production team saw over one hundred candidates for Shazam before casting Levi, who originally auditioned for a smaller part before being asked to audition and test for the lead. Angel, cast as Billy, shot his scenes for Shazam! in-between his commitments to the Disney Channel series Andi Mack. David Kohlsmith as 4-year-old William "Billy" Batson. Mark Strong as Dr. Thaddeus Sivana: A physicist who had grown up as an outcast in his wealthy family. Sivana himself was summoned by the Wizard Shazam as a child, but was not chosen as his champion, leading Sivana to spend his life trying to unlock the secret to return to the Rock of Eternity. Ethan Pugiotto as Young Thaddeus Sivana. Jack Dylan Grazer and Adam Brody as Frederick "Freddy" Freeman: Billy's adoptive brother and best friend, a disabled, nerdy superhero enthusiast who is the only person who knows that he is Shazam. Brody portrays Freddy's adult superhero alter-ego. Djimon Hounsou as Shazam: An ancient wizard seeking a successor, who bestows his powers on Billy Batson so that he can magically transform into an adult superhero. Hounsou previously portrayed Ricou, the King of the Fishermen, in Aquaman. Faithe Herman and Meagan Good as Darla Dudley: Billy's youngest foster sibling at his new home, an energetic and effusive little girl. Grace Fulton and Michelle Borth as Mary Bromfield: Billy's adoptive sister at his new home, the "den mother" who helps take care of the other kids and is debating attending college in California. Borth portrays Mary's adult superheroine alter-ego. Ian Chen and Ross Butler as Eugene Choi: Billy's adoptive brother at his new home, an obsessive gaming enthusiast and budding techie. Butler portrays Ian's adult superhero alter-ego. Jovan Armand and D.J. Cotrona as Pedro Peña: Billy's adoptive brother at his new home, a shy, sensitive kid who has trouble opening up. Cotrona portrays Pedro's adult superhero alter-ego. Marta Milans as Rosa Vasquez: The adoptive mother of the group home where Billy and his friends live. Cooper Andrews as Victor Vasquez: The adoptive father of the group home where Billy and his friends live. The film also features John Glover as Mr. Sivana, the estranged father of Dr. Thaddeus Sivana and the head of Sivana Industries. Wayne Ward portrays Thaddeus' bullying brother Sid as an adult and Landon Doak portrays Sid as a teenager. Andi Osho reprises her role as social worker Emma Glover from Sandberg's film Lights Out in an Easter egg appearance, Natalia Safran was cast as Mrs. Sivana, Doctor Sivana's mother. Safran previously portrayed Rina, the Queen of the Fishermen Kingdom of Atlantis in Aquaman. Caroline Palmer portrays Billy's biological mother Marilyn, who secretly allowed child services to take her son due to giving birth to him as a teenager. Director David F. Sandberg makes cameo appearances performing as each of the three Crocodile-Men (collaboratively assisted by Steve Newburn and Ned Morill), and provides the voice of Mister Mind for a mid-credits sequence. Sandberg's wife, actress Lotta Losten, portrays Dr. Lynn Crosby, a researcher working with Dr. Sivana. Sound designer Bill Dean has an uncredited cameo as the voice of a Batman toy. Ryan Hadley, Zachary Levi's stunt double, also appears as Superman in a silent cameo appearance where the character was only seen from the neck down at the end of the film. The Seven Deadly Sins – a supernatural team of villains consisting of the demons Pride, Envy, Greed, Lust, Wrath, Gluttony, and Sloth – were portrayed by stunt doubles in motion capture suits on-set during filming and depicted as CGI characters. Their voices were collectively provided by actors Steve Blum, Darin De Paul, and Fred Tatasciore. New Line Cinema began development of a Shazam! live-action feature film in the early 2000s, with multiple screenplay drafts by William Goldman, the team of Alec Sokolow and Joel Cohen, Bryan Goluboff, and John August. The version of the Shazam! script written by August, which went into pre-production in 2008, was an action-comedy which focused on the origin story of the hero, then known by his original name of Captain Marvel, and his young alter ego, Billy Batson. Peter Segal was attached as director and actor Dwayne Johnson was in talks to appear as the film's villain, Black Adam. The Shazam! film was being produced by New Line Cinema, which was absorbed into Warner Bros. during the course of development. Following the success of Warner's Batman film The Dark Knight and the commercial failure of its lighter, family-friendly Speed Racer during the summer of 2008, August departed from the project citing pressure from the studio to make the screenplay darker and more serious. In August 2009, Bill Birch and Geoff Johns, a prominent DC Comics writer, were assigned to write the screenplay, while Segal remained attached as director. In August 2010, the studio considered canceling the theatrical movie in favor of a live-action series for prime time network television. In December 2013, Segal stated that the film would not be happening, as the similarities between Captain Marvel and Superman had become an obstacle after the successful launch of Man of Steel. While development on the Shazam! film was in limbo, DC Comics rebooted the comic book franchise as part of their New 52 relaunch in 2012. Due to ongoing trademark conflicts with Marvel Comics, who owned the trademark for "Captain Marvel" for use with their own character of the same name, DC renamed their Captain Marvel superhero character "Shazam" at this time. DC had always been required to market and promote the character using the trademark Shazam! since acquiring the publishing rights from Fawcett Comics in 1972. Captain Marvel had originated at Fawcett in 1939, but fell into limbo after 1953 following a long legal battle with DC over Captain Marvel's similarities to Superman. In April 2014, Warner Bros. revealed the upcoming slate of films based on DC Comics properties. A Justice League film was set to be released in 2017, alongside upcoming adaptations of Shazam!, Fables, and 100 Bullets. The Shazam! film was tentatively set for release in July 2016. Dwayne Johnson confirmed he would be starring in Shazam! that August, but was undecided between portraying Shazam or Black Adam. In September, Johnson was confirmed to play Black Adam, while Darren Lemke was set to write the script. In January 2017, Henry Gayden was hired to rewrite Lemke's script. In February 2017, David F. Sandberg was in talks with the studio to direct Shazam!, Dwayne Johnson was set to first star in a Black Adam solo film, as opposed to appearing as the villain in Shazam!, while Doctor Sivana, another archnemesis of Shazam, became the Shazam! film's main villain. By July 2017, the studio had begun active development on Shazam! and Sandberg was confirmed as director, with production to begin in early 2018. Dwayne Johnson relayed that a different creative team was now involved than when he first signed on to the film, and stated his excitement over the studio's decision to split the film into two separate movies. After being cast as the lead, Zachary Levi stated in an interview, "the idea is that it's gonna feel like the movie Big, but with super powers" when he was asked about what direction DC Films and New Line Cinema are going for with Shazam! The film was later stated by Warner Bros. to be based on the 2012-2013 Shazam! backup feature from the Justice League comic book by writer Geoff Johns and artist Gary Frank, which told a modernized version of Shazam's origin. In August 2017, director David F. Sandberg stated that the film would be the next to shoot in the DC universe, and by the end of the month, it had begun pre-production. By October 2017, cinematographer Maxime Alexandre and production designer Jennifer Spence, who previously worked with Sandberg on Annabelle: Creation, were added to the production. The next month, Aquaman stunt coordinator Kyle Gardiner was hired to work on the film's action sequences. On January 12, 2018, the film's release date was officially announced. By September 2014, Dwayne Johnson was set to portray Black Adam in the film, but by July 2017, he had left the project to pursue a Black Adam solo film. In August 2017, the casting process for Shazam and other characters for the film had begun. Sandberg had stated in an interview that instead of de-aging an actor using special effects or CGI, he would cast both a child actor and an adult actor for the role of the main character. Zachary Levi, John Cena, Zane Holtz, Jake McDorman, Derek Theler and Billy Magnussen had all met with and/or auditioned for Sandberg for the role of Shazam. By October 2017, Levi was cast in the titular role. In November, Grace Fulton joined the cast as Mary Bromfield, one of Billy Batson's foster siblings. Fulton had previously worked with the same director in Annabelle: Creation. Later that month, Mark Strong was in final negotiations to play Dr. Sivana. Strong confirmed he would be playing the role by January 2018. By November 2017, Asher Angel was cast as the titular hero's child-age alter ego Billy Batson. In December, Jack Dylan Grazer was cast as Freddy Freeman, Batson's best friend. Later that month, Jovan Armand, Ian Chen, Faithe Herman, and Cooper Andrews were cast as Pedro Peña, Eugene Choi, and Darla Dudley, while Andrews portrayed Victor Vazquez, Batson's foster parent. By January 2018, Ron Cephas Jones entered talks to play the role of the wizard Shazam, who granted Batson his powers. Later that month, Spanish actress Marta Milans joined the cast to play one of the foster parents at the home where Billy lives. By the end of January 2018, actress Lotta Losten, wife of director David F. Sandberg, revealed that she had a role in the film. On April 23, 2018, Ross Butler was announced to have joined the cast. In July, it was announced that Djimon Hounsou had replaced Jones as the wizard Shazam, due to Jones having scheduling conflicts. Henry Cavill was in talks to reprise his role as Superman from previous DCEU films for a cameo, but was unable to because of scheduling conflicts. Principal photography for Shazam! began in Toronto and Hamilton, in Ontario, Canada on January 29, 2018, under the working title Franklin, and was scheduled to wrap by mid-May 2018. The film was set primarily in Philadelphia, Pennsylvania and firmly established within the DCEU. Most of the production was shot at Pinewood Toronto Studios and also several public locations around the city, including the University of Toronto, Woodbine Shopping Centre and Hearn Generating Station. In early March 2018, filming took place at Fort York National Historic Site in downtown Toronto. By early May 2018, Asher Angel, among other young cast members, had finished filming his part. Principal photography wrapped on May 11, 2018. Additional photography took place in Toronto between November and December 2018. Shazam! had a filming budget of only $90–100 million (and about $102 million once post-production was complete), making it the cheapest DCEU film to-date. Footage of the skyline and aerial shots, as well as other location work, were filmed in the city of Philadelphia in December 2018. David F. Sandberg's two-time collaborator Michel Aller served as the editor for Shazam!. Mike Wassel (Hellboy II: The Golden Army and The Fast and the Furious franchise) and Kelvin McIlwain (Aquaman) were the overall visual effects supervisors for the film. Technicolor's VFX studios Mr. X (known for The Shape of Water and Tron: Legacy) and Moving Picture Company (MPC) provided visual effects. Rodeo FX, Digital Domain, and Rise FX also worked on the VFX. On July 21, 2018, Benjamin Wallfisch was announced as the composer for Shazam!, marking the third collaboration with director David F. Sandberg after previously scoring Sandberg's Lights Out and Annabelle: Creation. Wallfisch previously provided additional music for Batman v Superman: Dawn of Justice, the second film in the DC Extended Universe. Wallfisch cited the influence of work of John Williams and scores from 1980s Amblin Entertainment films as inspirations for the Shazam! score, to match the tone of a film about "an old-school superhero from the Golden Age." In writing the score, Wallfisch stated that he was "picturing what might happen if a 14-year-old was put in front of a 100 piece orchestra and told there were no limits. I wanted the score to feel like it might have been written by an exuberant kid just having the time of his life with an orchestra." In April 2018, a first look at Shazam! was shown at the CinemaCon convention in Las Vegas, Nevada and the director David F. Sandberg introduced the behind-the-scene footage. During an interview with Film Riot Podcast in June 2018, Sandberg stated that "On this one, it was just like 'Yeah, I want this to be a classic superhero movie.' It takes place in the winter, so it's a lot of dark exteriors, but with a lot of colorful lights and stuff around them." On July 21, 2018, the first teaser trailer was shown at San Diego Comic-Con during the Warner Bros. panel at Hall H, with Sandberg, Zachary Levi, Asher Angel, and Jack Dylan Grazer in attendance. The trailer was later released online. It received a favorable response from journalists and audiences, who praised its humorous, zany tone. New footage from the film made its debut at Brazil Comic Con (CCXP) in São Paulo on December 9, 2018 during the Warner Bros. studio panel, with the footage described for the attendees as action packed. A new trailer was released on March 4, and a three-minute sneak peek was included with the digital home media of Aquaman. At the STP 500 on March 24, 2019, Shazam! was the primary sponsor of Aric Almirola and the #10 Ford Mustang in the Monster Energy NASCAR Cup Series. Almirola would go on to finish 9th after starting 2nd. On March 13, 2019, Warner Bros. Pictures announced that they were teaming up with Fandango for exclusive preview screenings on March 23, two weeks before release on 1,200 select screens and 40 exhibition circuits. Shazam! premiered in Toronto on March 15, 2019, and was released in the United States by Warner Bros. Pictures in RealD 3D, Dolby Cinema and IMAX 3D on April 5, 2019. As of April 21, 2019[update], Shazam! has grossed $120.4 million in the United States and Canada, and $201.5 million in other territories, for a worldwide total of $321.9 million. In the United States and Canada, Shazam! was released alongside The Best of Enemies and Pet Sematary, and was projected to gross $40–50 million from 4,260 theaters in its opening weekend. Two weeks before its release, the film grossed $3.3 million from Fandango advance screenings, higher than the $2.9 million made by fellow DCEU film Aquaman the previous December. It then made $5.9 million from Thursday night screenings, for a combined preview total of $9.2 million. The film grossed a total of $20.5 million on its first day, including Thursday previews. It went on to debut to $53.5 million, finishing first at the box office. In its second weekend the film made $25.1 million, retaining the top spot, before being dethroned by newcomer The Curse of La Llorona in its third weekend. In other territories, the film was released in 53 markets on the Wednesday and Thursday prior to the United States' and was projected to debut to $100–120 million, for a global opening of $145–170. In its first two days of international release the film made $15.7 million, finishing first in 48 of its 53 markets. It was then released in an additional 26 countries, including China where it made $16.4 million on its first day. It went on to have an international debut of $102 million, and a global total of $158.6 million. It came in first in 60 of its 79 markets, with its highest-grossing being China ($30.9 million), Mexico ($6.2 million), the UK ($5.3 million), Russia ($5.2 million) and Brazil ($5.1 million). At the review aggregator website Rotten Tomatoes, the film holds an approval rating of 90% based on 342 reviews, with an average rating of 7.28/10. The website's critical consensus reads, "An effortlessly entertaining blend of humor and heart, Shazam! is a superhero movie that never forgets the genre's real power: joyous wish fulfillment." On Metacritic, it has a weighted average score of 71 out of 100, based on 52 critics, indicating "generally favorable reviews". Audiences polled by CinemaScore gave the film an average grade of "A" on an A+ to F scale, while those at PostTrak gave it an overall positive score of 83% and a 61% "definite recommend". Nick Allen of RogerEbert.com said that "while Shazam! is goofier (and darker) than it may look, you'll wish its superhero came with a little more spark". The Hollywood Reporter's Frank Scheck called the film "Big on steroids" and praised the tone and performances. Alonso Duralde of TheWrap wrote "If the Wonder Woman and Aquaman movies represented DC Comics' first big-screen steps away from the austere color palette of the Zack Snyder movies, Shazam! takes us deeply into primary colors in a single bound... this new DC entry has a lovely lightness, both in the visuals and in its tone". Writing for The A.V. Club, Ignatiy Vishnevetsky gave the film a "B−" and said: "But while the story of an extremely overpowered champion rising to challenge a one-dimensionally sinister baddie might seem like the epitome of simplicity, Shazam! is still a modern-day tentpole blockbuster, overburdened with backstories for both hero and villain and subtexts that it can't (or won't) fully articulate". That publication followed up with a further consideration of masculinity in the film and the superhero genre generally by focusing on the transition of Billy Batson from an adolescent boy to a man with power and responsibility. Benjamin Lee of The Guardian gave the film 3/5 stars, wrote "The finale, while admirably self-contained and small-scale, grinds on for far too long, a boring escalation of anti-climaxes that cumulatively dull the intended emotional impact. It's a film in need of a tighter edit with a script in need of a sharper polish, an imperfect franchise-launcher that nonetheless represents significant progress for DC"
In April 2019, The Wrap reported that Warner Bros. is developing a sequel with Henry Gayden returning to write the film along with David F. Sandberg directing and Peter Safran producing. Mark Strong will reprise his role as Dr. Sivana. ^ "Film - Mad Ghost Productions". Mad Ghost Productions. June 11, 2018. Archived from the original on June 14, 2018. Retrieved June 12, 2018. ^ "Shazam! (12A)". British Board of Film Classification. Retrieved March 25, 2019. ^ Fuster, Jeremy (April 7, 2019). "'Shazam!' Surges to $53 Million Box Office Opening". TheWrap. Retrieved April 20, 2019. ^ a b c Anthony D'Alessandro (March 14, 2019). "'Shazam!' Looks To Strike Lightning With $45M Opening; 'Pet Sematary' Eyes Mid $20M+ – Early Tracking". Deadline Hollywood. Retrieved March 14, 2019. ^ a b "Shazam! (2019)". Box Office Mojo. Retrieved April 22, 2019. ^ a b McNary, Dave (August 19, 2014). "Dwayne Johnson Says He'll Play Role in 'Shazam'". variety.com. Archived from the original on July 9, 2015. Retrieved August 20, 2014. ^ a b c Hood, Cooper (July 21, 2017). "Dwayne Johnson Won't Be in Shazam, Confirms Geoff Johns". Screenrant. Archived from the original on July 25, 2017. Retrieved September 20, 2017. ^ Katie Kilkenny (March 23, 2019). "'Shazam! ': What the Critics Are Saying". The Hollywood Reporter. Retrieved March 23, 2019. ^ Mithaiwala, Mansoor (February 11, 2019). "Shazam! Movie Preview: New Footage Descriptions & Story Reveals". Screen Rant. Archived from the original on February 28, 2019. Retrieved February 28, 2019. ^ a b Kit, Borys (October 27, 2017). "DC's 'Shazam!' to Star Zachary Levi". TheHollywoodReporter. Archived from the original on October 28, 2017. Retrieved October 27, 2017. ^ a b Kit, Borys (November 6, 2017). "'Shazam!' Finds Its Billy Batson with 'Andi Mack' Actor". The Hollywood Reporter. Archived from the original on November 7, 2017. Retrieved November 6, 2017. ^ Verhoeven, Beatrice (April 4, 2019). "'Shazam!' Star Zachary Levi Was Cast After Director David F Sandberg Saw 'Over 100 People' (Video)". www.thewrap.com. Retrieved April 6, 2019. ^ Checcini, Mike. "How the Shazam Movie Brings Magic to the DCEU". Den of Geek. Retrieved April 6, 2019. ^ "David Kohlsmith (@davidkohlsmith) • Instagram photos and videos". ^ Prasad, R.A Karthik (July 22, 2018). "Shazam! Movie: Dr. Sivana's New Version Of Backstory Revealed". pursuenews.com. Archived from the original on July 23, 2018. Retrieved July 23, 2018. ^ a b c Kit, Borys (November 2, 2017). "'Shazam! ': Mark Strong in Talks for Villain Role". The Hollywood Reporter. Archived from the original on November 3, 2017. Retrieved November 2, 2017. ^ Ehrlich, David (March 23, 2019). "'Shazam!' Review: DC Surprises with One of the Most Fun Superhero Movies Ever Made". IndieWire. Retrieved April 4, 2019. ^ a b N'Duka, Amanda (December 6, 2017). "It Actor Jack Dylan Grazer Joins Shazam". Deadline. Archived from the original on December 7, 2017. Retrieved December 6, 2017. ^ a b c d e Bentley, Jean. "Surprise! Your Fav "OC" & "Riverdale" Alums Are In "Shazam"". www.refinery29.com. Retrieved April 6, 2019. ^ David F. SandbergVerified account. "David F. Sandberg on Twitter: "The wizard is named Shazam in the movie, I just think theyâ€™re trying to avoid confusion in news/articles.â€Ś "". Twitter.com. Retrieved April 5, 2019. ^ a b Hibberd, James (July 10, 2018). "DC's Shazam! casts Guardians actor Djimon Hounsou as the Wizard". Entertainment Weekly. Archived from the original on July 10, 2018. Retrieved July 10, 2018. ^ a b "Exclusive: DC's 'Shazam!' casts 'Guardians' actor Djimon Hounsou as the Wizard". EW.com. Archived from the original on July 10, 2018. Retrieved July 10, 2018. ^ a b Outlaw, Kofi (December 21, 2017). "DC's 'Shazam' Adds 'This Is Us' Actress Faithe Herman to Cast". Comicbook. Archived from the original on December 22, 2017. Retrieved December 21, 2017. ^ a b c d "Production Starts on New Line Cinema's Magical Super Hero Action Adventure "Shazam!"". Business Wire. February 5, 2018. Archived from the original on February 8, 2018. Retrieved February 5, 2018. ^ a b Kroll, Justin (November 2, 2017). "Annabelle Creation Actress Grace Fulton Joins Shazam". Variety. Archived from the original on November 7, 2017. Retrieved November 2, 2017. ^ a b c N'Duka, Amanda (December 12, 2017). "Ian Chen & Jovan Armand Join Shazam". Deadline. Archived from the original on December 13, 2017. Retrieved December 12, 2017. ^ a b Ramos, Dino-Ray (January 22, 2018). "'Shazam! ': Marta Milans Joins Zachary Levi In New Line Superhero Pic". Deadline. Archived from the original on January 23, 2018. Retrieved January 22, 2018. ^ a b N'Duka, Amanda (December 19, 2017). "The Walking Dead's Cooper Andrews Joins Shazam". Deadline. Archived from the original on December 21, 2017. Retrieved December 19, 2017. ^ "Smallville's John Glover Reveals His Secret Shazam! Role". CBR. March 10, 2019. Retrieved March 27, 2019. ^ "'Shazam!' & Horror Flick 'Lights Out' Share Same Cinematic Universe, Apparently". cbr.com. Archived from the original on June 17, 2018. Retrieved December 7, 2018. ^ "Credits | Andi Osho". Retrieved November 2, 2018. ^ 4. "DISCUSSION: Was "Shazam!" not set to feature a character from "Lights Out" in an Easter Egg Cameo Appearance? : DC_Cinematic". Reddit.com. Retrieved April 5, 2019. ^ "'Aquaman' and 'Shazam!' Features 2 of the Same Actors as 4 Different Characters". Comicbook.com. Archived from the original on November 4, 2018. Retrieved November 2, 2018. ^ Patches, Matt (April 5, 2019). "Shazam director reveals the voice behind his post-credits scene tease". Polygon. Retrieved April 6, 2019. ^ Peris, Sebastian (March 22, 2019). "'Shazam!' Star Lotta Losten Reveals First Look At Her Character Dr. Lynn Crosby". Heroic Hollywood. Retrieved April 4, 2019. ^ Ramos, Dino-Ray (April 5, 2019). "'Shazam!' Director David F. Sandberg Talks Going Horror To Superhero And Bringing Inclusivity To Family Narrative". Deadline Hollywood. Retrieved April 6, 2019. ^ Graham, Jamie (January 2019). "Super Size Me". Total Film. pp. 52-61: Future Publishing Ltd.
^ "Shazam! It ain't happening". johnaugust.com. Archived from the original on February 12, 2018. Retrieved February 11, 2018. ^ a b "Exclusive: Peter Segal's Shazam Gets a New Title!". IESB.net. February 23, 2008. Archived from the original on February 29, 2008. Retrieved December 21, 2017. ^ a b August, John. "Shazam! It ain't happening". johnaugust.com. Archived from the original on February 12, 2018. Retrieved July 26, 2018. ^ Seijas, Casey (January 6, 2009). "'Shazam!' Screenwriter On Film Development: 'It Won't Be Happening'". MTV News. ^ Marshall, Rick (January 13, 2009). "Captain Marvel/Shazam Movie Still Alive? Producer Michael Uslan Hints at Film's Future". MTV News. Archived from the original on July 27, 2011. Retrieved January 19, 2008. ^ Boucher, Geoff (August 6, 2010). "Captain Marvel Takes Flight But Will He Ever Reach the Big Screen". Los Angeles Times. Archived from the original on April 30, 2013. Retrieved August 20, 2014. ^ "Interview: Director Peter Segal Steps Into the Ring for Grudge Match - ComingSoon.net". December 23, 2013. Archived from the original on July 5, 2014. Retrieved August 20, 2014. ^ Smith, Zack (December 30, 2010). "An Oral History of CAPTAIN MARVEL: The Lost Years, pt. 3". Newsarama. Archived from the original on December 19, 2013. Retrieved September 11, 2014. ^ "Exclusive: GEOFF JOHNS Hopes Lightning Strikes SHAZAM!". Newsarama.com. January 26, 2012. Archived from the original on April 6, 2013. Retrieved July 8, 2015. ^ Bricken, Rob. "The Captain Marvel/Ms. Marvel/Shazam Clusterf*ck Explained". Archived from the original on January 31, 2018. Retrieved December 5, 2017. ^ "The World's Mightiest Mortal and Big Red Cheese". The Museum of Comic Book Advertising. Archived from the original on January 13, 2010. Retrieved June 17, 2005. In 1953, the case was finally settled out of court when Fawcett agreed to quit using the Captain Marvel character(s) and pay DC the sum of $400,000. ^ "Justice League, Fables, 100 Bullets, Metal Men & Shazam Films Revealed". scifinow.co.uk. April 28, 2014. Archived from the original on April 29, 2014. Retrieved April 29, 2014. ^ "Warner Bros. Plans 'Justice League' Movie Directed by Zack Snyder (Exclusive)". blogs.wsj.com. April 27, 2014. Archived from the original on April 28, 2014. Retrieved April 29, 2014. ^ Finke, Nikki (June 12, 2014). "What Warner Bros/DC Comics Is Planning At Comic-Con In July". Nikki Finke. Archived from the original on June 14, 2014. Retrieved June 12, 2014. ^ a b Kroll, Justin (September 3, 2014). "Dwayne Johnson to Play Black Adam in New Line's 'Shazam,' Darren Lemke To Script". variety.com. Archived from the original on September 5, 2014. Retrieved September 3, 2014. ^ Kit, Borys (January 19, 2017). "Dwayne Johnson's DC Villain Black Adam Getting His Own Movie". The Hollywood Reporter. Archived from the original on December 6, 2017. Retrieved January 30, 2018. ^ McNary, Dave (February 17, 2017). "'Shazam': Superhero Movie Eyes 'Lights Out' Director". Variety. Archived from the original on July 13, 2017. Retrieved July 25, 2017. ^ Kit, Borys (July 20, 2017). "'Shazam!' Is Next DC Movie to Shoot (Exclusive)". The Hollywood Reporter. Archived from the original on July 22, 2017. Retrieved July 22, 2017. ^ Leane, Rob (December 16, 2017). "The Rock Wishes Shazam Team 'Best of Luck'". Screen Rant. Archived from the original on December 8, 2017. Retrieved December 16, 2017. ^ Holmes, Adam (January 10, 2018). "Zachary Levi Compares Shazam To A Classic Tom Hanks Movie". CinemaBlend. Archived from the original on January 30, 2018. Retrieved January 10, 2018. ^ "GEOFF JOHNS TO EXPAND CREATIVE ROLE BECOMING A FULL-TIME WRITER/PRODUCER FOR FILM, TELEVISION AND MORE; EXCLUSIVE TO DC AND WARNER BROS". Warner Bros. Pictures. June 11, 2018. Archived from the original on June 14, 2018. Retrieved June 12, 2018. ^ Peris, Sebastian (August 16, 2017). "'Shazam' Director Says Earlier Versions Of The Script Featured Black Adam". Heroic Hollywood. Archived from the original on September 9, 2017. Retrieved August 17, 2017. ^ Auger, Andrew (August 29, 2017). "Shazam! Has Officially Begun Pre-Production". Screen Rant. Archived from the original on September 2, 2017. Retrieved August 30, 2017. ^ Marc, Christopher (October 19, 2017). "'Shazam!' Adds 'Annabelle 2' Cinematographer and Production Designer". OmegaUndeground. Archived from the original on May 22, 2018. Retrieved May 21, 2018. ^ Marc, Christopher (November 24, 2017). "'Shazam!' Hires 'Thor: Ragnarok' and 'Aquaman' Stunt Coordinator". OmegaUnderground. Archived from the original on May 22, 2018. Retrieved May 21, 2018. ^ a b McNary, Dave (January 12, 2018). "DC's 'Shazam!' Gets 2019 Release Date". Variety. Archived from the original on June 18, 2018. Retrieved June 18, 2018. ^ Peris, Sebastian (August 25, 2017). "David Sandberg On Moving Right Into 'Shazam' From 'Annabelle: Creation'". Heroic Hollywood. Archived from the original on August 26, 2017. Retrieved August 25, 2017. ^ Kit, Borys (October 27, 2017). "Shazam! 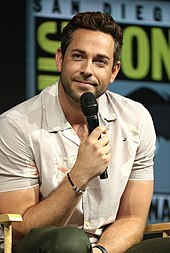 To Star Zachary Levi (EXCLUSIVE)". The Hollywood Reporter. Archived from the original on May 1, 2018. Retrieved April 26, 2018. ^ Michael Vassallo (September 1, 2017). "DC Comic's 'Shazam!' Director Confirms Grace Fulton Is Mary Marvel". Heroichollywood.com. Archived from the original on December 17, 2017. Retrieved December 16, 2017. ^ Sky, Rick (January 14, 2018). "Mark Strong spills on Shazam! secrecy". ContactMusic.net. Archived from the original on January 15, 2018. Retrieved January 14, 2018. ^ Gonzalez, Umberto (January 18, 2018). "'This Is Us' Star Ron Cephas Jones Circles Wizard Role in DC Superhero Film 'SHAZAM!' (Exclusive)". TheWrap. Archived from the original on January 19, 2018. Retrieved January 18, 2018. ^ Losten, Lotta [@lottalosten] (January 31, 2018). "Yes! I have a role in Shazam! I can finally say that!" (Tweet). Retrieved January 31, 2017 – via Twitter. ^ Kroll, Justin (April 23, 2018). "'13 Reasons Why' Actor Ross Butler Joins DC's 'Shazam!'". Variety. Archived from the original on April 24, 2018. Retrieved April 23, 2018. ^ Siegel, Tatiana; Kit, Borys (September 12, 2018). "Henry Cavill Out as Superman Amid Warner Bros.' DC Universe Shake-Up (Exclusive)". The Hollywood Reporter. Archived from the original on September 12, 2018. Retrieved September 12, 2018. ^ Mitchell, Bea (September 19, 2017). "Superhero movie Shazam! to start filming in early 2018". DigitalSpy. Archived from the original on September 21, 2017. Retrieved September 20, 2017. ^ Marc, Christopher (September 14, 2017). "The Working Title of The 'Shazam!' Movie Revealed". OmegaGround. Archived from the original on September 20, 2017. Retrieved September 20, 2017. ^ "David F. Sandberg on Instagram: Let's go!⚡️". Instagram. Retrieved January 29, 2018. ^ "Current Productions & News". Toronto.ca. August 7, 2017. Archived from the original on March 20, 2018. Retrieved March 6, 2018. ^ Williams, Caleb (September 18, 2017). "CONFIRMED: 'Shazam!' Begins Filming This February in Toronto". OmegaGround. Archived from the original on September 30, 2017. Retrieved September 20, 2017. ^ Cohen, Jason (March 6, 2018). "Shazam Set Video Shows Zachary Levi's DC Hero In Action". CBR.com. Archived from the original on March 7, 2018. Retrieved March 6, 2018. ^ Hood, Cooper (May 7, 2018). "Shazam! Star Asher Angel Officially Wraps Filming". ScreenRant.com. Archived from the original on May 8, 2018. Retrieved May 7, 2018. ^ Sandberg, David F. [@ponysmasher] (May 11, 2018). "That's a wrap on Shazam! Now onto months of post production" (Tweet). Retrieved May 11, 2018 – via Twitter. ^ Marc, Christopher (October 23, 2018). "Shazam! Confirmed To Get Two Weeks Of Reshoots Next Month In Toronto". OmegaUnderground. Geeks WorldWide. Archived from the original on October 25, 2018. Retrieved October 24, 2018. ^ "Shazam! Reshoots Reportedly Extended To Late December". ScreenRant. November 8, 2018. Archived from the original on November 10, 2018. Retrieved November 10, 2018. ^ D'Alessandro, Anthony (April 8, 2019). "'Shazam!' Scribe Henry Gayden To Pen Sequel". Deadline Hollywood. Retrieved April 20, 2019. ^ "Shazam Budget Reportedly $80-$90M; Suits Didn't Cost $1M". ScreenRant. January 19, 2019. Retrieved January 30, 2019. ^ HughE, Dillon (November 30, 2018). "'SHAZAM Films in Philly this Weekend, Kendall Jenner will be at Sixers Game Tonight". Philly ChitChat. Archived from the original on December 3, 2018. Retrieved December 2, 2018. ^ "MR. X Bangalore, India is open for business!". VFX Online. February 9, 2018. Archived from the original on May 23, 2018. Retrieved May 22, 2018. ^ "Shazam! Official Teaser Trailer". Animation Boss. July 21, 2018. Archived from the original on July 23, 2018. Retrieved August 8, 2018. ^ "Art of VFX Shazam!". Art of VFX. January 21, 2019. Retrieved January 21, 2019. ^ "Benjamin Wallfisch to Score David F. Sandberg's 'Shazam!'". Film Music Reporter. Archived from the original on July 22, 2018. Retrieved July 21, 2018. ^ "'BATMAN V SUPERMAN: DAWN OF JUSTICE' - ORIGINAL MOTION PICTURE SOUNDTRACK RELEASE". Benjaminwallfisch.com. Archived from the original on August 27, 2018. Retrieved August 26, 2018. ^ Burlingame, Jon; Burlingame, Jon (April 4, 2019). "Composer Benjamin Wallfisch Scores High in Versatility With 'Hellboy,' 'Hostile,' 'Shazam!'". Variety. Retrieved April 22, 2019. ^ Beedle, Tim. "Benjamin Wallfisch Sets Shazam! 's Magic to Music". DCComics.com. ^ Burlingame, Russ (April 24, 2018). "'Shazam!' Footage Shown at CinemaCon". Comicbook.com. Archived from the original on April 26, 2018. Retrieved April 25, 2018. ^ Williams, Tommy. "SHAZAM! Officially Confirmed to Take Place in Winter". Geek Tyrant. Archived from the original on June 16, 2018. Retrieved June 16, 2018. ^ Liptak, Andrew (July 21, 2018). "The first trailer for DC's Shazam is like Big, but with superheroes". theverge.com. Archived from the original on July 22, 2018. Retrieved July 22, 2018. ^ Newby, Richard (July 23, 2018). "Why 'Shazam!' Was Biggest Surprise of Comic-Con". The Hollywood Reporter. Archived from the original on August 14, 2018. Retrieved August 13, 2018. ^ Barnhardt, Adam (December 9, 2018). "New 'Shazam!' Footage Debuts at CCXP". Comicbook.com. Retrieved January 4, 2019. ^ "Race Results". NASCAR.com. March 24, 2019. Retrieved March 24, 2019. ^ "Aric Almirola, a self described Batman fan, to drive Shazam car at Martinsville". Tireball.com. March 21, 2019. Retrieved March 24, 2019. ^ Anthony D'Alessandro (March 13, 2019). "'Shazam!' To Preview Two Weeks Before Opening Via Fandango Screening Program". Deadline Hollywood. Retrieved March 14, 2019. ^ "'Shazam' Toronto Premiere". Entertainment Tonight Canada. March 15, 2019. Retrieved March 24, 2019. ^ Rebecca Rubin (April 3, 2019). "Box Office: 'Shazam!' Heads Toward $45 Million-Plus Opening Weekend". Variety. Retrieved April 3, 2019. ^ Anthony D'Alessandro (March 24, 2019). "'Shazam!' Paid Previews Are Super At $3.3M, Beating 'Dragon 3', 'Aquaman' & More". Deadline Hollywood. Retrieved March 24, 2019. ^ Anthony D'Alessandro; Nancy Tartaglione (April 5, 2019). "'Shazam!' Whams $5.9M In Thursday Night U.S. Previews For $9.2M Cume, Eyes $145M+ WW Launch – Friday AM Update". Deadline Hollywood. Retrieved April 5, 2019. ^ a b Anthony D'Alessandro (April 7, 2019). "'Shazam!' Shoots To Super $53M+ Opening, $56M+ With Previews; 'Pet Sematary' Purrs $25M – Sunday AM B.O. Final". Deadline Hollywood. Retrieved April 7, 2019. ^ Anthony D'Alessandro (April 14, 2019). "'Shazam!' Still The Man With $23M+; 'Little' Grows Up; 'Hellboy' Cold With $12M+; 'After' Works Overseas – Midday B.O. Update". Deadline Hollywood. Retrieved April 14, 2019. ^ Nancy Tartaglione (April 7, 2019). "'Shazam!' Strikes $102M Overseas Bow; 'Pet Sematary' Digs $17M; 'Dumbo', 'Us' Top $200M WW – International Box Office". Deadline Hollywood. Retrieved April 7, 2019. ^ "Shazam! (2019)". Rotten Tomatoes. Fandango. Retrieved April 7, 2019. ^ "Shazam! reviews". Metacritic. CBS Interactive. Retrieved April 7, 2019. ^ Allen, Nick. "Shazam! Movie Review & Film Summary (2019) | Roger Ebert". www.rogerebert.com. Retrieved April 10, 2019. ^ Scheck, Frank (March 23, 2019). "'Shazam! ': Film Review". The Hollywood Reporter. ^ Duralde, Alonso (March 23, 2019). "'Shazam!' Film Review: DC Comics Gets a Bouncy Burst of Big-Screen Ebullience". TheWrap. ^ Vishnevetsky, Ignatiy (March 23, 2019). "'Shazam!' Zaps an Old-Fashioned Superhero into a Blockbuster World". The A.V. Club. ^ Hassenger, Jesse (April 9, 2019). "Shazam! Redefines Masculinity in the DC Universe". The A.V. Club. Retrieved April 9, 2019. ^ Lee, Benjamin (March 23, 2019). "Shazam! review – kid-friendly DC adventure is enjoyably old school". The Guardian. ^ Gonzalez, Umberto (April 8, 2019). "'Shazam!' Writer Henry Gayden Will Return to Write Sequel (Exclusive)". The Wrap. Retrieved April 8, 2019. ^ "Mark Strong Will Return As Dr. Sivana For Shazam! 2". wegotthiscovered. April 5, 2019. This page was last edited on 22 April 2019, at 22:42 (UTC).